White short-sleeved shirt, with v-neck, edged in red, adjoining a white rectangular insert, with two white buttons fastening to an overlapping insert, Large embroidered red emblem on left breast, alongside neck insert. Embroidered red star above the emblem. Lower-case 'v' in red, below the emblem. A white scroll, outlined in red, below the 'v', with the opponent's name in capitalised red lettering within it, and the year in red below the scroll. Two embroidered red concentric diamonds on right breast, alongside neck insert. Number split into two shades of red, on reverse and on right breast below the Umbro logo. Surname in capitalised red lettering above number on reverse, in same double-shaded font as the numbers. White shorts, with red drawstring. Small hooped triangle at the bottom of each seam, containing two shades of red. Red number on left thigh in same double-shaded font as on shirt, with two red concentric diamonds underneath. Embroidered red emblem on right thigh. White socks, with two dark-red hoops and three light-red hoops across tops. In the five friendly games, England's captain wore a red armband with a red emblem, a lower-case 'v' in red below the emblem, a white scroll, outlined in red, below the 'v', with the opponent's name in capitalised red lettering within it and the year in red below the scroll. The armbands worn in the European Championship final tournament were blue and featured the UEFA RESPECT logo. In the World Cup qualification matches, they were plain red. A long-sleeved version of the shirt was also worn, though a number of players wore a white base layer underneath, instead. There were no distinguishing features on the lower sleeves. The shirts worn by Ashley Cole, and Adam and Glen Johnson also included their first initial i.e. A. COLE, A. JOHNSON and G. JOHNSON. Cole continued to display his first initial, despite Carlton and Joe Cole making their last appearances in 2010. Alex Oxlade-Chamberlain only included his paternal family name (CHAMBERLAIN) on his shirts. For the games in the European Championship final tournament, England had logos embroidered onto the upper sleeves. The UEFA EURO 2012 logo was on the right arm and the UEFA RESPECT logo was on the left arm. In the five World Cup qualification fixtures, England had the 2014 FIFA WORLD CUP BRAZIL QUALIFIERS logo embroidered onto the right sleeve and the MY GAME IS FAIR PLAY FIFA logo on the left sleeve. The names of England's opponents, as they appeared in the scrolls, were BELGIUM, BRAZIL, FRANCE, HOLLAND, ITALY, MONTENEGRO, SAN MARINO, SWEDEN and UKRAINE. England wore an alternative pair of red shorts against Italy in Bern, with a white drawstring, a white number on the left thigh in the same font as on the shirt, two white concentric diamonds underneath and a white emblem on the right thigh. 42 players wore this shirt. Even though Welbeck appeared in more games than anyone, Gerrard started more games and was on the pitch for around half an hour longer than Welbeck. 11 players made their international debut in this shirt, but four of them never played again for England, and another three made just one more appearance. Fraizer Campbell saw just fifteen minutes of action (including added time) on the shirt's debut, against Netherlands, in his only full international. Leon Osman won both of his caps in this shirt. Raheem Sterling, on the other hand, had made 47 appearances by the end of 2018. Another six players won their last cap in the shirt, including John Terry, making his 78th appearance. 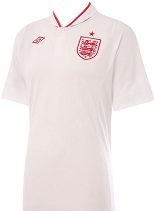 8 players scored their first goal for England in this shirt, with Welbeck going on to score 14. For 4 of them, it was their only international goal, and for Steven Caulker, it was also his only appearance, in the 4-2 defeat to Sweden, in Stockholm. Defoe's goals gave him a total of 19 and he then had to wait four years for his twentieth. Following Stuart Pearce's selection of Parker as captain for the only time, Roy Hodgson gave the armband to Gerrard and stuck to his decision, without any of the controversies that had dogged Fabio Capello over his selections. Gerrard was also captain on the occasion of his hundredth appearance, against Sweden, in Stockholm, coincidentally, the same opponents from when he was captain for the first time, in 2004. His 98th appearance, however, ended two minutes early, when he picked up a second yellow card and was sent off against Ukraine in a World Cup qualifier. Umbro signed off, after 28 years continuous service to the England team, with a design guaranteed to please the purists. For the first time in 903 full internationals, England took to the field without any trace of blue in the kit. 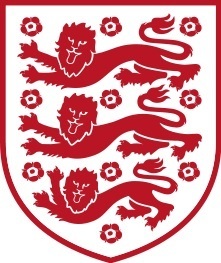 Even the crest was rendered completely in red and England, thus, entered the Football Association's 150th year with a kit that purely reflected the colours in the cross of St. George. It was also a switch back to predominantly all white, after the previous kit's blue shorts, and with the addition of a pair of red shorts against Italy, Umbro managed to introduce a colour combination that was unique in the national team's history. With Fabio Capello resigning just three weeks before England's friendly with the Netherlands, Stuart Pearce was temporarily given charge of the team, but it was Roy Hodgson who was the surprise choice to take the job on a permanent basis, and his first task was to get them through the European Championship final tournament, where England reached the quarter-finals, with a mostly defensive approach. The following season, however, England rose to third in the FIFA rankings, beating both Italy and Brazil, before it was time for Umbro to hand over the responsibility of dressing the England team to their parent company, Nike. England wore the white home shirt and socks with the red home change shorts, against Italy. England: Jack Butland, Martin Kelly, Danny Rose, J.McEachran, Steven Caulker, C.Dawson, Alex Oxlade-Chamberlain, Jordan Henderson, M.Sordell (W.Keane), H.Lansbury (G.Gardner), Wilfried Zaha (Jonjo Shelvey). England: J.Steele, Martin Kelly (Nathaniel Clyne), D.Rode, Jonjo Shelvey, Steven Caulker, R.Bennett, B.Marshall, Jordan Henderson, C.Wickham (T.Lees), M.Waghorn (Wilfried Zaha), T.Ince. England: Jack Butland, A.Smith, Danny Rose, Jack Rodwell (J.Lowe), Steven Caulker, C.Dawson, Wilfried Zaha, Jordan Henderson, M.Sordell (C.Wickham), T.Ince, Raheem Sterling (Andros Townsend). England: Jack Butland, A.Smith, Danny Rose, J.Lowe, Steven Caulker, C.Dawson, Wilfried Zaha (Raheem Sterling), Jordan Henderson, M.Sordell (T.Lees), T.Ince, N.Delfouneso (C.Wickham). England: B.Amos (J.Steele), A.Smith (Nathaniel Clyne), J.Robinson (L.Moore), J.McEachran (W.Hughes), A.Wisdom (H.Maguire), T.Lees, T.Ince (M.Waghorn), Jordan Henderson (Nathaniel Chalobah), C.Wickham, N.Powell, Andros Townsend (B.Afobe). England: J.Steele (D.Rudd), A.Smith (T.Lees), J.Robinson, J.McEachran (Nathaniel Chalobah), A.Wisdom, C.Dawson, T.Ince, Jordan Henderson (W.Hughes), Wilfried Zaha (J.Lowe), Jonjo Shelvey (H.Lansbury), B.Afobe (C.Wickham). England: Jack Butland (J.Steele), Nathaniel Clyne (A.Smith), Danny Rose (J.Robinson), Nathaniel Chalobah (T.Carroll), A.Wisdom, C.Dawson, H.Lansbury (N.Delfouneso), Jordan Henderson (J.Lowe), Wilfried Zaha (C.Wickham), Jonjo Shelvey, Raheem Sterling (M.Sordell). England: J.Steele, A.Wisdom (Michael Keane), Danny Rose (A.Smith), J.Lowe, T.Lees (Nathaniel Clyne), C.Dawson (J.Robinson), Andros Townsend, Nathaniel Chalobah (J.McEachran), C.Wickham (N.Delouneso), Jonjo Shelvey (M.Sordell), Raheem Sterling (Jordan Henderson). The shirt worn by Theo Walcott against San Marino at Wembley.